British national John R. Davies was a pioneer on “Eco-tourism in Thailand” and began his professional career as a research ecologist for the Natural Environment Research Council in Britain. In 1989 he moved to Thailand to study the cultures and languages of the hill tribes. In 1992 he founded Lisu Lodge, a brilliant idea in time for the promotion of a new mode of tourism, protecting the natural landscape and delicate equilibrium between visited villagers and visiting tourists. Since then, Lisu Lodge has won an award from the Pacific Asia Travel Association (PATA) and is today managed by East West Siam Ltd. in Bangkok, whose managing director is Frenchman Vincent Tabuteau. To get to Lisu Lodge, head out from Chiang Mai and drive north on National Road no.107 passing Mae Rim District until you reach Mae Malai Market in Mae Taeng District roughly 40 km from Chiang Mai. There you turn left into National Road no.1095 to Mae Hong Son and continue 3.5 km to turn right and drive along a small paved road another 10 km to Ban Ton Lung. When reaching the “Lisu Lodge” signboard, turn left another half kilometer to reach the lodge. Lisu Lodge offers simple cottage style accommodation on the edge of an authentic Lisu village surrounded by lychee plantations. It is designed to give tourists an experience of hill tribe life in the mountains of Northern Thailand. 24 simple bedrooms with private bathrooms are convenient located around a central living area with traditional cushions and low tables. Kitchen and staff rooms are located in another house nearby. There are several villages of other ethnic groups in the area, so that trekking and mountain biking are activities not to be missed. Furthermore, white water rafting and a visit at the Mae Taeng Elephant Camp are additional options. But what is the most fascinating encounter during a stay at Lisu Lodge is to indulge in the tranquility of the place and to be far away from the pollution and traffic of Chiang Mai City. Lisu Lodge provides a base to explore the hill tribes at the foothills of Chiang Dao Mountain, especially the Lisu and their instant neighbors, the Akha, Lahu and Hmong people. Each group has its own distinctive culture, language and religion. Originally, the Lisu have their origins in Mongolia and record their distant history in songs that are the library of Lisu culture. This is very important to appreciate, because the Lisu have no script by their own, no recorded history and also no homeland. 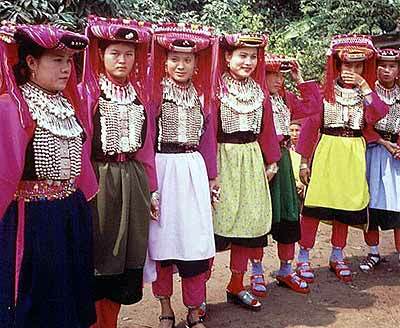 The language of the Lisu belongs to the Tibeto-Burman family and has six different tones. Actually, it is very hard to learn and understand, practice the many dialects and use Chinese loan-words. Luckily, in Ton Lung it is no problem to converse with the Lisu in Thai and see the influence of Thai Buddhist culture at work. Interesting to note is that the Lisu practice a pragmatic religion as a result of their long wanderings and migrations via Eastern Tibet and Yunnan into Myanmar and to Thailand. The Lisu are traditionally pure animists in the “shaman” tradition of the far north, but they also practice ancestor worship in the Chinese tradition. Some Christian influence is seen in the worship of the creator god “wusa”, while their old grandfather spirit called “apamo” is responsible for births, weddings, and deaths in the village. 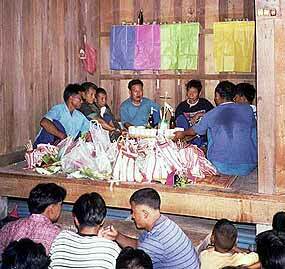 Chicken and pigs will be slaughtered during spirit ceremonies and moon festivals, especially at Chinese New Year. The Lisu grow rice and corn, some vegetables and exotic fruits, and in former times poppies to produce opium. Making handicrafts is a very important occupation, complementing the family income of poor farmers. Tourism is certainly a good opportunity to find employment, but also has its backlash. More and more young people leave the village to the cities, where especially the uneducated will end up in dubious professions. Certainly, tourism will accelerate this process. On February 25, the Board of Investment (BoI) Northern Region and Northern Economic Investment Center (NIC) invited the local mass media to visit activities that were supported through their SME policy. Two companies were visited, Chiang Mai Ploylin Co., Ltd. in Chomthong district, and T.T.T Candle Co., Ltd. in Hangdong district. 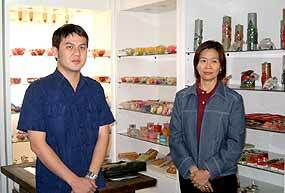 Theerawat Phorjai, the vice managing director of T.T.T Candle took the local mass media to visit the BoI SME investment support project. Siriporn Nurak, the director of NIC said, “If businesses wish to expand, they can request as much funds as they need, depending on the type of business enjoying BoI permission. There are seven types of businesses: agriculture, ceramics, light industry such as cards or elaborate artifacts, metal working such as panel beating, electronics, chemicals and service industries. The BoI also provides advice and assistance in relations with officials, Department of Industry, export support centers, and others. Plans to develop an international convention centre in Phuket have been shelved on the instructions of prime minister, Thaksin Shinawatra. A spokesman for the ministry of tourism told TTG Daily News the much-anticipated development of the centre had been “indefinitely postponed” and probably would not begin until 2007. PM Thaksin gave two reasons for the decision. Firstly, the investment climate in Phuket is thought to be too “cloudy” at the moment because of restoration and reconstruction work following the tsunami tragedy. The other reason is that the PM wants the Phuket convention center to be modeled on the Chiang Mai convention center and that hasn’t been built yet, said the spokesman. Construction of the Chiang Mai facility is expected to start soon after a decision has been made on where to locate it, and could be ready for use 18 months later. A new property in Chiang Rai - the Amari Teak Garden Resort - is the latest addition to the Thai chain’s portfolio. The property is built in the Lanna style. The resort has 76 guest rooms with hardwood floors, and is being positioned to cater to both leisure and business travelers. There are also meeting facilities. Amari will be introducing the hotel to the travel trade at next week’s ITB travel fair in Berlin.